Craft show mistakes can be costly. They not only harm your sales the day of the event, they can also harm your brand and get in the way of future sales. There are a lot of elements that go into selling at a craft show and perfecting each one can take years. But you can sell at your very first craft show successfully and learn from others’ craft show mistakes. Yes, I’m talking about my costly mistakes. I was the poster child for a craft show don’t when I started out. But having spent over a decade selling and shopping at craft shows, adjusting and critiquing booths, I’ve discovered the staples of a good vendor booth and the mistakes to avoid. I love using analogies so let’s imagine EOS (a strong brand I reference frequently) as a small handmade business, debuting their products at a craft show. These are made up scenarios to help you see how a major lip balm brand may have flopped at a craft show because of these mistakes, or succeeded by doing the opposite. 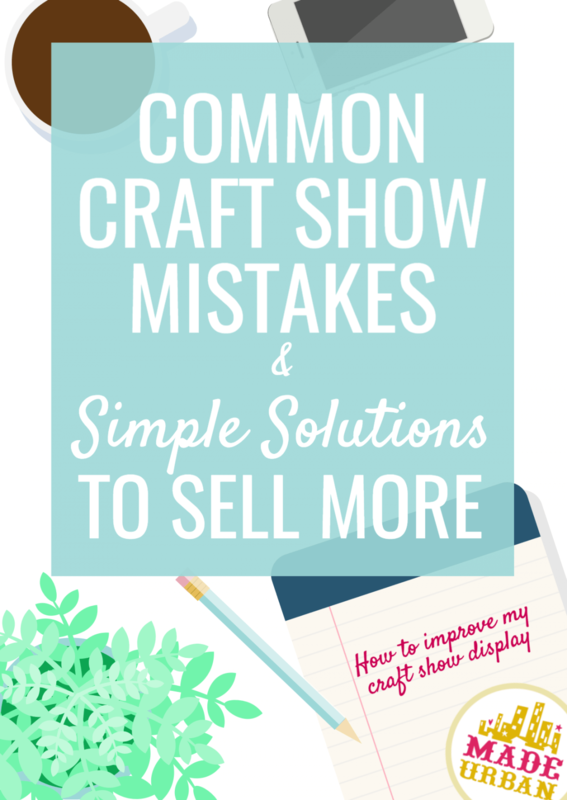 This article covers a brief outline of the solutions to these mistakes and if you’re looking for more details, you’ll find everything you need to know about making the best impression possible at craft shows in my e-book: MAKE MORE MONEY AT CRAFT FAIRS. I’ve noted the Chapter each solution is covered under so you can check out the Chapter outline by following the link. This is probably the most common mistake among craft show vendors and I’ve definitely been guilty of it myself. We’re creative creatures and want to show off just how crafty we can get. But when you’re constantly changing or expanding your offering, it makes it really hard to build a strong brand. EOS has created their signature pod shaped lip balms and are launching them at a craft show. But they also made shampoo, conditioner, laundry soap, hand soap, foot cream and face cream to sell, in hopes they reach a wider audience and make more sales. They have a hard time displaying their products because there isn’t a cohesive theme to them. They group each type of product together and hope craft show shoppers will work their way through the selection (instead of drawing their attention to a specific product or collection). The craft show shoppers are most interested in their lip balm but at the end of the day, EOS didn’t notice because they only stocked a few of each product and therefore their sales were scattered across the board. They also have a hard time standing out at the craft show since shoppers don’t notice anything unique about their products. There are a couple other vendors selling handmade bath and body items so craft show shoppers don’t feel as though the need to buy from EOS. It’s more a matter of price and convenience. EOS decides to debut just their lip balms at the craft show but offer a variety of flavours. Their limited product selection allows them to focus on all the details that make their brand unique. Their colorful pod shaped packaging is used for both their lip balms and hand creams and their products are marketed towards customers interested in organic ingredients. They created three different flavors/scents for their product which makes it really easy to create a craft show display and direct shoppers’ attention towards one collection at a time. Mint comes in turquoise packaging, Strawberry comes in pink and Honeydew in a lime green. The product groupings create bright blocks of color on their craft show table that instantly catch shoppers’ attention. Your craft show display fixtures, props, lighting, signage, etc. should be well planned and used to strengthen your brand and handmade product’s value. Meaning; when shoppers look at your display, they think the prices of your handmade products will be higher than they actually are. If the details that surround your products at a craft show make people think your prices are lower than they actually are, it’s hurting your sales. It makes it really hard to convince a craft show shopper to buy when their first impression is that your handmade products should be cheaper. There are so many elements that go into a great craft show display that not only attracts shoppers but also helps convert them into customers. From the overall style of your space right down to the tablecloth; no detail is too small. If you’d like me to walk you through setting up a craft show display that stands out and makes you money, sign up for my free 5 day challenge. You guessed it; trying to keep up with stocking 7 different products didn’t leave much time to think about their craft show display. They pulled a white tablecloth off their dining room table and emptied a few baskets around the house to hold their products. The craft show props don’t match, let alone work with the products. Signage is made right before the doors open by quickly scribbling some prices on paper and creating cards that sit in front of each grouping. In an ideal world, EOS took my free 5 day challenge and started thinking about their craft show display fixtures and props the second they were accepted to the craft show. They came up with such a fun concept for their space, choose a style that attracted their ideal customer and applied it to every little detail. Craft shows are getting more and more competitive each year. You need to think of your space as its own store and create a unique atmosphere for shoppers to walk into. Merchandising is a job retailers take very seriously because they know where and how they place their products, can make or break sales. I worked for 2 multi-million dollar retailers over 10 years and picked up several tricks of the trade (which are obviously shared in my e-book). I was also able to see, firsthand, how small merchandising changes make a big impact on sales. EOS owners thought: people care about the product, not what’s around it so they arranged their products on the craft table and thought that was that. But craft show shoppers don’t notice them from across the room since their display doesn’t implement height or eye-catching elements. The lack of composition leads people who do stop by to feel overwhelmed, not knowing where to look next and feeling like there’s too much to take in. They may even miss their cute lip balms because they get lost among all the other products. Purchasing the proper props and display fixtures allows EOS owners to group their collections together, add height and interest to their craft show display and create compositions that create a natural flow to their space. Craft show shoppers notice their space from across the room. Although they can’t see their products, they notice their bright, colorful and fun display and know it’s a booth they need to stop at. Once at their craft show table, shoppers can take in one collection and message at a time and walk away with a clear understanding of the brand. With limited time to grab people’s attention, they ensure their space communicates who they are, what they’re selling and why shoppers should care about their products. For tips on a craft show display that catches shoppers’ eyes as soon as they step into the venue and encourages more sales, join my free 5 day challenge. You’ll receive 5 emails that walk you through how to come up with a unique craft show concept that works with your products, brand and customers. Follow the simple exercises at the end of each email to bring your ideas to life and have the most stunning display at the craft show! When we make mistake # 1 (products that lack direction), it leaves us with very little time to focus on the details. We’re too busy trying to perfect a wide variety of handmade products and build up enough stock in each that we don’t put thought or time into packaging, tagging, wrapping, etc. Imagine if a store placed the product you just fell in love with and bought, into a crumpled plastic bag they previously had their groceries in? Would it take away from the experience a bit? Would you be as excited about the product when you got it home and unwrapped it? And would you feel encouraged to purchase from them again? EOS nailed their pod shaped lip balm container but didn’t carry that through to their other products so their brand lacks direction with a hodge-podge of packaging. Their wide selection of products means they’re basically jacks of all trades, master of none. It also leaves them with a lack of direction when it comes to targeting their products towards a specific customer. Wrapping is an afterthought since most of their time went into producing 7 different types of products and when a sale is made, they simply toss the item into a generic bag and thank the customer for their purchase. With just one product, they are able to properly brand and design pod shaped containers for their lip balm to help them stand out. There are lots of companies who sell lip balm but their branding makes people want to purchase yet another lip balm to own something unique (it gives people “social currency” to feel like they’re onto something and discovered a cool new product before others). 1 product also allowed them to test different formulas to find a combination that produced an amazing lip balm. There are now able to brand all their product as 95% organic, 100% natural and paraben/petroleum free. They stamp their logo on colored bags and match the bag and tissue paper color to the color of the collection the bought item is from. They offer to spritz each shopping bag with the fragrance of the collection, which carries the delicious scents of their products throughout the craft show and has shoppers following their noses to find where it’s coming from (i.e. a watermelon lip balm gets a watermelon colored shopping bag, tissue paper and ribbon. And they spritz a little bit of watermelon scent on the tissue paper). This one is also covered in our sample chapter: MAKING PRODUCT THAT PROFIT which you can download right now! You’re always representing your brand so it’s important to look and play the part of someone who’s an expert in what you’re selling. I’ve also been guilty of this. I had a tendency of leaving things until the last minute and being up until 2 am the night before a craft show. I had no interest in doing my hair or finding a cute outfit…I just needed to get out the door on time. But through trial and error I got my act together and realized how important my look was. Just as you’d be a little weary of a salesman trying to sell you on luxury while wearing wrinkled clothes and swearing like a trucker, your craft show shoppers are scoping you out to see if you and your brand seem authentic. EOS business owners stayed up LATE the night before the craft show trying to make enough inventory for each of their 7 products. They roll into the event in sweat pants and a t-shirt and haven’t even thought about their sales pitches. They figure: We made the product, we’ll know what to say and how to sell it. They stumble over their words and miss mentioning some really important selling features their ideal customers would be interested in. There is also so much to cover when it comes to the benefits of each product. It’s a bit of a struggle to find the right words on the spot to tie everything together since their products and branding lack focus. EOS business owners knew that if they wanted to successfully sell products that promoted beautiful skin, their skin better look its best and that they needed a good night’s sleep before the event. Their brand is all about natural beauty so they keep their looks fresh and clean and make sure their lips are looking moisturized. They spent time thinking about the features that really make their products stand out. They know lots of companies sell skincare products made from organic ingredients so they examined several aspects of their business to pull the important pieces together to help them make sales. From the reason they started their company and their values, to their manufacturing and product benefits; they worked out the perfect pitches for the business and each product. They feel completely relaxed and natural selling. They also want to get feedback at the craft show so they can continue to improve their product to appeal to their target market so they brainstorm specific questions to ask shoppers. Being so prepared makes them feel comfortable at the craft show, which makes their shoppers feel comfortable. Which mistakes do you commonly see at craft shows? Share in the comment section below! Thanks so much Angela!! That’s so great to hear and I’m glad you’re enjoying the articles. Let me know how “making less” goes and if you have any questions along the way! I very much enjoyed this article. I make and sell wind chimes made of silver plate silverware and glass beads. I set up every Sat at our local farmer’s market and do a thriving business. I am finding that I want more. I want to expand into on line sales. I have tightened my business and only sell wind chimes. My whole show comes out of one crate. I keep distractions to a minimum….but am having a hard time with hawkers…you know those people so insecure that they must distract your customers and call them over to their booth. Any advice? I ask nicely for them to stop(it is against market rules) and they ignore me. I am sure there are alot of people dealing with this rude behavior. I would appreciate a solution. Love your ideas. Thanks for reading Karen! Great question. I’ve never had to deal with vendors like that but can understand how frustrating it would be. 1) Try creating a bit of a barrier between your booth and theirs so shoppers are out of view from the other vendors. For example, if you have a full booth with a tent, invest in side walls and set your table or display back in your booth so shoppers walk in and your left and right neighbour can’t see them until they step out of your space. If you have a table instead of a booth, perhaps your displays could be a little higher on the sides. 2) You could mention their behavior to the organizer and ask not to be placed near them at the next event. 3) As difficult as it may seem, do your best to ignore them and focus on your shoppers. It sounds like you have a unique product to set you apart from other vendors and as a shopper, I would personally be annoyed with someone calling me over and would probably ignore them. I appreciate you responding to my comment. I have spoken to the market manager and she has promised to speak with the vendor. I could not isolate my booth. I hang the wind chimes around the perimeter of the tent. I also have the option of putting up 2 10foot tents which will hang about 40 wind chimes…tables are set up in the middle. This usually hushes up other vendors and we will sell out. Thank you for your help. As a newbie, I craft homemade natural scented soy candless at craft shows. Thank you for your articles. I will focus less on making too many scents and narrow it down to my best sellers, and take your recommendations to not crowd my table so the attention will be on my candles aND melts. Hi Eva, thanks for reading! I hope the information helps you at your next event. Let me know how it goes and if you have any questions! I always package my items in a plastic bag because I do outside shows and it protects my knitted items from dirt and dust that’s flying around n d. My customers appreciate the effort to keep things clean. Hi Erin. I enjoyed your article as it contained many helpful hints. I craft greeting cards, notebooks, boxes and other paper products. I have 2 card stands to display my cards and this makes the cards very visible. I need some ideas on setting up the tables. I usually have only tables. I think I need to have a white theme because the cards and books are very colourful. In Australia, because of the weather, we have craft fairs all year round. I would love to attach something to the ceiling but generally that isn’t allowed. Any ideas? But you could make one half that size and sit it on top of your table to add height to your display.